Posting an ACK after a long time. I fully appreciate the efforts of Prabhat in keeping this project alive at a time when there seemed few takers for these glorious sagas of our historical achievements and cultural roots. And I have also realised my folly in underestimating the impact it could have on the minds of not only the present younger generation but also the generations to come. This is much more than a mere blog and it should be taken as a mission and be accomplished with zeal, as Prabhat is already continuing to do with the help of many known and unknown contributors. I only hope other contributors and full members shall consider the thoughts and come forward to support the cause. Presenting now the story of one of the bravest soul of Indian history, Rani Lakshmibai of Jhansi. Here is what ACK says about this great daughter of India, who died young fighting the imperialistic british monarchy. 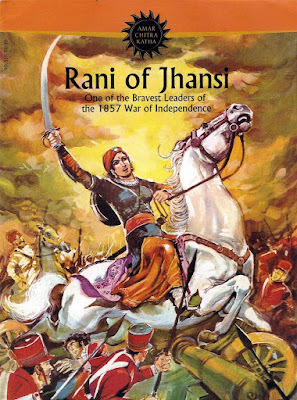 Rani (Queen) Laxmibai of Jhansi is today a symbol of the first organized Indian resistance to British rule. She was born (c. 1828) in a conservative priestly family, but she got an unconventional education including trained in martial arts like the boys of her age. Married to the King of Jhansi, a small principality in central India, she became the ruler when her husband died prematurely. She governed well and earned the respect of her people. At the time, British authority was well established in India, and had started taking over the independent principalities like Jhansi using legal loopholes. The Rani petitioned against such an attempt to the authorities in India as well as Britain, to no avail. About the same time a small rebellion among the Indian soldiers of the British army was developing into a full war for independence as many aggrieved Indian princes declared their determination to drive out the British. Laxmibai decided to cast her lot with the forces fighting the British. In the battles that follow, she inspired her people and personally led the forces. When the enemy, partly through treason, gained footing in her fort, the Rani donned a man's attire and escaped to friendly camps. She succeeded in winning over the ruler of Gwalior and getting refuge in that fort. When the British turned their attention to the Gwalior fort, she again fought bravely but eventually fell in combat. Today, across many parts of India the memory of her last stand is celebrated with the iconic image of her on a horse, sword unsheathed, poised for attack. The Sun Dynasty or Solar Dynasty or Suryavansha is one of the most prominent dynasties in the history of Hinduism, along with the "Chandravansha" or Lunar Dynasty. "Suryavanshi" means a person belonging to this dynasty. This clan was the eldest and the most prosperous in ancient India till the rise of Magadh in the 6th century BC. Ayodhya, the city founded by Vaivasvata Manu son of Vivasvan or Vaivasvata, was their capital. The following is the list, in chronological order, of the monarchs of the solar dynasty. Most of them were rulers of Ayodhya and therefore, Kings of Kosala. According to Bhagwat Purana, Brahma created sage 10 sages using his mental powers -Marichi, Atri, Angiras, Pulastya, Pulaka, Kratu, Vasishtha, Prachetas or Daksha, Bhrigu, Nārada., one of whom was Marichi. Kashyapa, the son of Marichi and Kala, is regarded as the father of humanity. His sons from Aditi, the sky goddess, and the daughter of Daksha Prajapati are called Adityas (Sons of Aditi), they were, Aṃśa, Aryaman, Bhaga, Dhūti, Mitra, Pūṣan, Śakra, Savitṛ, Tvaṣṭṛ, Varuṇa, Viṣṇu, and Vivasvat or Vivasvan. Vivasvan or Vaivasvata (one of the sons of Lord Sun) - the Sun God, progenitor of the clan. His parents were the sage Kashyapa, father of all beings, and Aditi, Aditi's 12 sons, the Adityas, are the sun deities, and both Vivaswan and Aditya mean sun. Therefore another name for Vivaswan is Surya or the Sun, hence the name, Suryavansha. Vivaswan's sons include Shrraaddev and Shanishchar. The river Tapi was named after Vivaswan's sister Tapti. Manu or Vaivasvata Manu - the King of all mankind and the first human being. (According to Hindu belief there are 14 Manvantaras; in each, Manu rules. Vaivasvata Manu was the seventh Manu. Manu is referred to as a Rajan (King) in the Shatapatha Brahmana scripture. He founded the town of Ayodhya. He had nine sons, Vena, Dhrishnu, Narishyan, Nabhaga, Ikshvaku, Karusha, Saryati, Prishadhru, Nabhagarishta and one daughter, Ila, who was married to Budha of the Lunar Dynasty). He left the kingdom to the eldest male of the next generation, Ikshvaku, who was actually the son of Manu's brother Shraaddev. Ikshvaku - the first prominent monarch of this dynasty, giving the dynasty its another name the Ikshvaku dynasty. He had one hundred sons. Fifty of them ruled Uttarapath (Northern India) and fifty ruled Dakshinapath (Southern India). Vikukshi - He is said to have eaten the meat of a rabbit at the time of Shraddha and was known as Shasad. (Some records claim him to be grandson of Ikshvaku.) His son was Kakuthsa or Puranjay. Kakutstha or Puranjaya - He was a brave king and fought in the Devasur Sangram. His original name was Puranjaya. But after he annihilated Asuras (demons) while sitting on the hump (Kukud) of a bull, he was known as Kakuthstha, which means seated on the hump. His dynasty was also known as Kakuthstha after him. Shravast - He founded the town of Shravasti near Kosala. Kuvalashva - He killed a Rakshasa named Dhundh. It is said that Dhundhar region and the Dhund river are named after Dhund. Eighteen of Kuvalashva's sons died in the battle with Dhund. Thereafter, Kuvalashva was called "Dhundhumara". Prasenjit I - His daughter Renuka was married to sage Jamdgni. She was mother of Parashurama. Yuvanashva II - He was married to Gori, daughter of the Chandravanshi king Matinaar. Mandhata - He became a famous and Chakravarti (ideal universal ruler) king. He defeated most of the other kings of his time. He married Bindumati, a daughter of the Chandravanshi king. Purukutsa - He performed the Ashwamedha Yajna (horse sacrifice). He married Nagkanya "Narmada". He helped Nagas in their war against the Gandharvas. Satyavrata or Trishanku - His original name was Satyavrata, but he committed three (tri) sins, and hence got the name Trishanku. First, while he was a prince, he misbehaved and was temporarily exiled from the kingdom. Next, he killed the milch cow of his preceptor Vasishta. His third sin was that he used the unsanctified meat of his kill as food. Trishanku also had a desire to ascend to heaven in his mortal body. After Vashistha refused him this boon, since it is against nature to ascend into heaven as a mortal, the sage Vishwamitra, Vashistha's rival, created another heaven for him, called "Trishanku's Heaven", and located in mid-air. His sons were Dhundumara, and Harishchandra, who was borh of the princess of "Kaikaya" named "Satyaraksha". Harishchandra - He is known for his honesty, truth and devotion to duty or Dharma. Bahu or Asit - He was attacked and defeated by another clan of Kshatriyas. After this, he left Ayodhya and went to the Himalaya mountains to live as an ascetic with his queens. At that time Yadavi queen was pregnant with Sagara. Sagara - He recaptured Ayodhya from the "Haihaya" and "Taljanghi" Kshtriyas. He then attempted to perform the horse sacrifice, Ashwamedha Yajna. However, the sacrificial horse was stolen by the god Indra on the south eastern shores of the ocean, which was at that time an empty bed with no water in it. At least sixty of Sagara's sons died attempting to recover the horse, also causing great destruction by their reckless search. Puranic legends say the number of his sons was 60 thousand. Asmanja - Sagara's surviving son was not made king due to his bad conduct. Anshuman - He was the grandson of Sagara, and his successor as king. He did penance in an attempt to bring the holy river Ganges to earth, that she might wash away the sins of his ancestors. Dileepa I - He also tried to bring Ganges to earth, but also failed. Bhagiratha - Sagara's great-grandson, after strenuous penances, at last succeeded in bringing Ganga down from heaven. When she flowed over the remains of his ancestors, their souls were redeemed, and the ocean was refilled. Ganga also bears the name "Bhagirathi", in honour of his deed. Ambarish - According to Buddhist legends, he went to Tapovana to be a renunciant but after a public outcry returned and ruled for some time. Saudas or Mitrasah - He performed the Ashwamedha Yajna, but as the rituals were concluding a Rakshasa tricked him into serving human meat to Brahmin,s including Rishi Vashishta. He was then cursed by the Brahmins. He wanted to curse them back, but his wife prevented him. He spent twelve years in exile in the forest. Raghu II or Dirghbahu - He was a famous king, who conquered most of India. The great epic Raghuvamsa describes his victories. After him the Sun dynasty was also known as the dynasty of Raghu or Raghu Vansha. Rama - He is considered the seventh Avatar of the god Vishnu. He is worshiped by every Hindu. 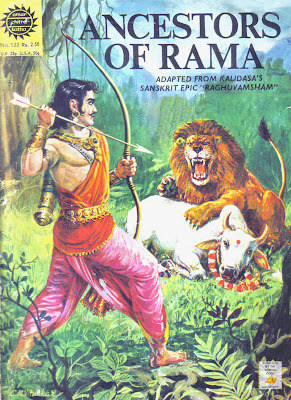 Rama's story before he became king of Ayodhya is recounted in the Ramayana. After he ascended the throne, he performed the Ashwamedha Yajna. Bharata, his younger brother, won the country of Gandhara and settled there, where his two sons, Taksha and Pushkal, founded the cities of Taksashila and Pushkalavati, now known as Taxila and Peshawar. Rama's third brother, Lakshmana, founded Lakshmanpur, now known as Lucknow, and his youngest brother Shatrughna, Lakshmana's twin, was given Madhura which is now known as Mathura. Sumitra - He was the last king (118th) of Ayodhya from solar dynasty. In the fourth century BC, emperor Mahapadma Nanda of the Nanda Dynasty forced Sumitra to leave Ayodhya. He went to Rohtas with his sons. His son Kurma established his rule over Rohtas. Above motioned Information based on Wikipedia, but modified with help some more authentic sources. This one is contributed by Ajay, many many thanks to him. Update: One more ACK added. Today Ajay send another ACK & requested to post for forthcoming my kids Birthday. Today Birthday of Ajay Misra. Bring peace and joy to you. Many many happy returns of Day! 3rd October Birthday of my twins, daughter "Aastha" & son "Harsha", that is why presenting two different series by same publisher. Hope you also like the IDEA. Like the two of you! 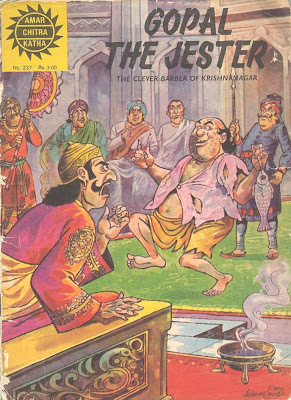 Tinkle is an Indian monthly comic Indian magazine, published in several Indian languages. Originally owned by the India Book House, the Tinkle brand was acquired by ACK Media in 2007. The Magazine combines comics, puzzles, quizzes, contest and other features in a unique mix targeted at school children. It is published in English and syndicated in many Indian languages. 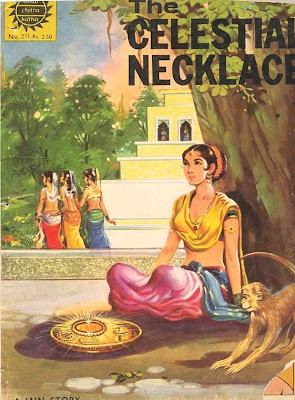 Anant Pai was the founding editor of the magazine, who became popular among its readership as Uncle Pai. He also launched the popular ACK series. The first issue was printed in 1980, and more than 600 issues have been printed so far. The magazine carries comic stories and regular columns of interest to school children. Tinkle enjoys great popularity, and has been an integral part of growing up in India in the last two decades. Characters like Suppandi and Shikari Shambu that appeared first in the pages of the magazine have nation wide recognition. Readers send more than 200 letters with stories and other features to be considered for printing in the magazine. 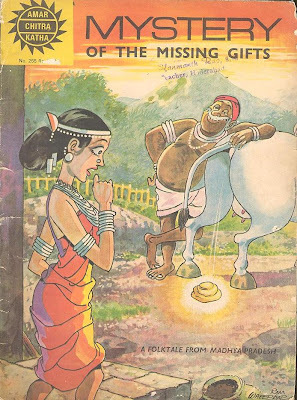 The wholesome combination of educational and entertainment that defines Tinkle has many celebrity fans in India, including the former Prime Minister of India, Atal Bihari Vajpayee. All 3 comics are Ajay's contributions. All thanks & credits go to him. The comics posted here are in .cbr/.cbz format. A small utility (Comic Display) is required in order to read these files on computer screen. This can be downloaded from here.